The McIntosh's are fifth generation innovative North Idaho farmers who have used sustainable, no-till farming practices for years and now provide their customers with organic products without genetic modified organisms (GMOs), pesticides, or chemical fertilizers. You can find their premium organic stone-ground milled and unmilled whole grains and seeds grown on rich rain-fed North Idaho soil at local Pullman, WA restaurants, the Moscow Food Coop, and at the Lewiston and Moscow Farmers Markets. You can meet the farmers at their newly opened Lindsey Creek Winery located on their farm where they produce wine from their 15 acre vineyard. Harvest Ridge Organics hosts our food barley variety trial, spelt variety trial, and our quinoa breeding projects focused on heat tolerance, evolutionary participatory breeding and mycorrihizae association. Finnriver is an organic family farm and artisan cidery located along a restored salmon stream located off Center Road, in the rural Chimacum Valley, a traditionally agricultural region on the Olympic Peninsula of Washington. A Washington State Certified Organic farm and a Salmon Safe farm, Finnriver is protected by conservation easements with the Jefferson Land Trust, ensuring that this will remain sustainably working land. You can buy their blueberries, raspberries, blackberries, strawberries, black currants, a diverse selection of vegetables, flowers, popular squash varieties, several heirloom apple varieties, honey, and eggs at the Port Townsend Food CO-OP, Port Townsend Farmers Market, and through the U-Pick Collective. Stop by their tasting room to try their hard ciders and spirited dessert wines crafted from their organic and homestead fruits. Finnriver hosts our food barley variety trial, quinoa variety trial and our quinoa breeding projects focused on heat tolerance, evolutionary participatory breeding, mycorrihizae association, and transplant production. Dharma Ridge Farm is located on the historic 100+ acre Boulton Farm in Quilcene, growing about 25 acres of mixed vegetables. Dharma Ridge Farm is WSDA Certified Organic and farms with soil health and vibrancy in mind, using cover crops, crop rotations, compost, and organic-approved soil amendments and preparations. 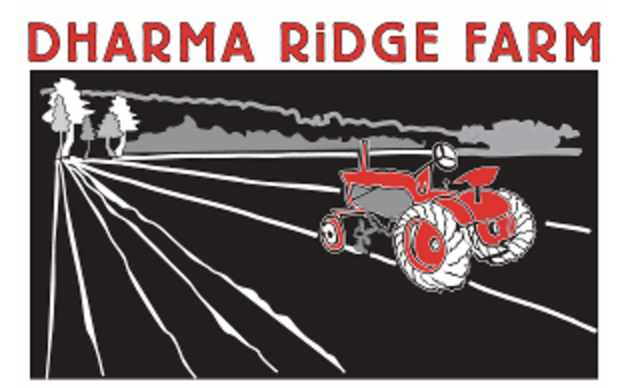 Dharma Ridge Farm's fine vegetables can be found at local Farmers markets as well as The Port Townsend Food Coop, Chimacum Corner Farmstand, Salish Sea Trading Cooperative, Central Coop and through various local restaurants and fine food artisans. Dharma Ridge is growing several of our quinoa breeding populations. Prairie Creek Farm is famous for its potatoes grown in the rich soils along the East Moraine of Wallowa Lake. The farm also grows a variety of other Oregon Tilth Certified Organic vegetables including carrots and beets. Catch up with farmer Pat Thiel as he makes his 650 mile round trip drive out to Portland to sell his foraged goods and farm's gems at the PSU Farmer's Market. You can also find Prairie Creek Farm vegetables at stores and restaurants throughout Portland, Hood River, and Wallowa County. Lab member, Ian Clark, hails from Clark Farm, a 4,000 acre farm minutes away from Washington State University. Clark Farm rotates growing spring and winter wheat, garbanzo beans, and canola across it's rolling Palouse landscape. At his farm, Ian Clark has been experimenting with growing quinoa for several years. Clark Farms hosts our quinoa variety trials and perennial wheat trials. Wayne and Jacie Jensen are the third generation to farm their land. 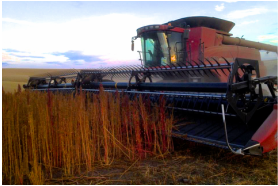 They produce peas, lentils, garbanzo beans, barley, native grass seeds, and wildflowers on their farm located between Moscow and Genesse along the Idaho and Washington border. They are also experimenting with new crops including sunflower, quinoa, and teff. Using direct seeding practices, Jencrops Farm protects the soil from erosion, is increasing soil organic matter, and uses less fuel farming the land. Jencrops Farm raises wheat for Shepherd’s Grain, and appreciates being a part of a group of like-minded farmers who care about the quality of the food they produce and the preservation of the most precious natural resource, the soil. They host our no-till quinoa, and malting barley and hulless food barley variety trials. The Gross family has been in the farming business for 460 years in Switzerland, Romania, Ukraine, Canada, and the US. They started the Spokane Hutterian Brethren farm in 1960 and now grow a variety of crops both with and without irrigation using direct seeding practices to manage soil erosion. Spokane Hutterian Brethren raises wheat for Shepherd’s Grain as their sole source of income, encouraging relationships between growers and customers to raise awareness of the challenges of the food production chain. They are hosting our no-till quinoa, millet, and malting and hulless food barley variety trials. Neil Appel raises sheep along with a variety of crops, including quinoa, using direct seeding practices. Appel Prairie Farm hosts our wireworm trial in barley, oats, quinoa and wheat as well as our quinoa, food barley, and malting barley trials. The Washington Grain Commission is a self-governing agency of the State of Washington. The WGC focuses on strengthening existing markets and developing new markets for PNW small grains, encouraging and supporting research to optimize grower, buyer and end user benefits, and promoting and providing education. The American Malting Barley Association;'s (AMBA) mission is to help ensure an adequate supply of high quality malting barley for the malting, brewing, distilling, and food industries. AMBA fosters and supports the research to develop malting barley varieties with improved agronomic and quality characteristics. The goal is to keep malting barley competitive with other crops so that growers continue to plant it and produce an adequate supply of malting barley of consistent and suitable quality. Improvements in yield, disease resistance, lodging resistance, and other agronomic characteristics are coupled with improvements in malting and brewing quality for improved utilization by our industry. The Clif Bar Family Foundation created Seed Matters to improve the viability and availability of organic seed to ensure healthy, nutritious and productive crops. Seed Matters offers fellowships to support the next generation of organic plant breeder, researcher, entrepreneur, and seed policy leader. Ian Clark, researching perennial wheat, is funded by Seed Matters. Hannah Walters was fully funded by the Seed Matters/Clif Bar Family Foundation as a Graduate Student Fellow for her MS. The family-owned and operated Lundberg Family Farms has been growing rice since 1937. They use eco-positive farming methods to produce their grains and value-added foods. They are funding lab members Julianne Kellogg and Kristofer Ludvigson and their research in organic and farmer participatory quinoa breeding, quinoa-livestock integration, direct seeded vs. transplanted quinoa, and association of quinoa with mycorrhiazae. The Sustainable Agriculture Research and Education program has distributed over $80 million across the western region in grants supporting research and education to foster sustainability and have brought about substantial changes in producer practices over time. Farmer and rancher engagement is a critical part to Western SARE grants. All grant proposals are required to include producer participation and demonstrate outreach to producers. Seats are assigned to producers on the decision-making Administrative Council and Western SARE sponsors sub-regional listening sessions. Western SARE is funding Gina Nichols' no-till quinoa and food barley research. The National Institute of Food and Agriculture (NIFA) provides leadership and funding for programs that advance agriculture-related sciences with a focus on ensuring the long-term viability of agriculture. With an integrated approach, NIFA's supported scientific discoveries reach the people who can put them to use. NIFA partners with land grant universities and government, private, and non-profit organizations, and requires the research, education, and extension programs to provide solutions to those who need them. Earthbound Farm started in 1984 on 2.5 acres, and now works with growers on nearly 50,000 acres to produce organic salad greens. Earthbound Farm's organically certified produce is packaged in 100% post-consumer recycled PET plastic containers. As a company, they have planted over 700,000 trees. You can buy Earthbound Farm's prewashed and packaged salad greens in most grocery stores, or stop by their farm stand in Carmel, CA. 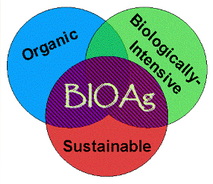 BIOAg is the Grant Program of the WSU Center for Sustaining Agriculture & Natural Resources. The goal of BIOAg is to engage a broad, interdisciplinary spectrum of WSU faculty in projects that further the development, understanding, and use of biologically-intensive and/or organic principles, practices, and technologies to improve the sustainability of agriculture and food systems in Washington State. In addition, BIOAg funding is used to meet three objectives: to stimulate new research initiatives, to augment critical gaps in existing areas of knowledge, and to move existing, game-changing research out into the real world. Lab member, Leonardo Hinojosa, is funded by his home country, Ecuador, to conduct research in breeding quinoa for heat tolerance. Karl Kupers and Fred Fleming began farming in new ways to keep their land productive for decades to come and to enable their wheat to be sold at a fair price. These farming ideas are called sustainable agriculture. Karl and Fred loved the idea of sustainable agriculture so much that they completely transformed their farms to a new way of farming and selling grain, and Shepherd's Grain was born. Not only is Shepherd's Grain wheat good for the environment and the economy, it tastes delicious and their flour is excellent to bake with. Today, there are nearly 60 growers who raise wheat for Shepherd's Grain. These growers are from three geographical areas: southern Alberta, the Pacific Northwest and southern California. They all use sustainable farming methods and are or becoming certified by a third party audit. Buy their flour or bread made with their flour at a store or bakery near you! Organic Seed Alliance is a 501 (c)(3) that advances the ethical development and stewardship of the genetic resources of agricultural seed. OSA works to address consolidation through regional seed networks that result in transformative change at the national level. Their collaborative research emphasizes diversity, ecology, and shared benefits. Their education builds the base of knowledge necessary for stewarding seed and enhancing diversity through on-farm innovation. And their advocacy promotes the benefits of organic seed while simultaneously confronting threats. Today, OSA has a ten-year track record that establishes itself as the leading organic seed institution in the U.S. Each year they educate thousands of farmers and other agricultural community members, conduct professional organic plant breeding and seed production research, and advocate for national policies that strengthen organic seed systems. Seeds released under the OSSI pledge include Dr. Kevin Murphy's spelt varieties, Elwha and White Salmon.